This soft, feminine collection arrived late last week. Today one of our regular customers bought this fabric to make a baby quilt. Sweet! This is the final week to register you UFOs. Bring them in by 4 p.m. on Saturday, January 31 to join the challenge. An astute customer brought it to our attention that the UFO Challenge rules state "five lucky people will win $100 gift certificates." With that in mind, we will limit the winning certificates to one per person. But remember . 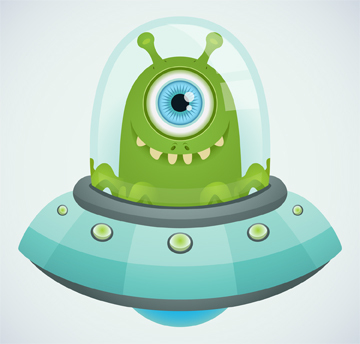 . . the more UFOs you finish the better your odds are of having your name drawn on June 6. Happy sewing! If you've been in the shop over the past week you've seen this beautiful quilt on display. If you haven't been in, do stop by . . . it's worth seeing! This block-of-the-month, Plain & Fancy, begins on March 1, 2015 and wraps up in November (nine months total). The cost of the program is $27.99 per month, plus tax. The first month’s payment is due to reserve your space and we will bill your credit card for each subsequent month. On the 1st or 2nd of each month stop by the store to pick up your block for the month. If you’re participating from out of town we’ll mail your blocks on the 1st or 2nd. An additional shipping charge will be added to your credit card if we are mailing your blocks; they will be delivered via Priority US mail. Call 970-565-7541 or stop by the shop to sign up today. We’re limited to 24 participants and based on early response this one is sure to sell out, so don’t wait! Here are just a few of the many beautiful postcards made by our talented customers. These will be mailed to Postcard Party Headquarters this week. 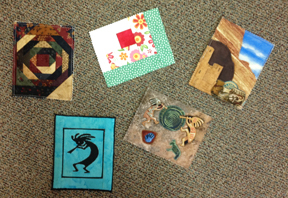 In return, we'll get back postcards made by other quilters from all over the country. We'll schedule a postcard exchange party for everyone who participated as soon as we receive our return shipment. Thanks to everyone who participated in this fun, nationwide event. Just think how cute your dog or cat would look on one of these! No pets in the house? Make one for your favorite toddler. This pet pillow or mini-sofa measures 30″ wide by 20″ deep. We used the wonderful Crossroads 54″ wide denim for this one. Stop by the shop to see the sample that Judy Bryan made. She will teach this class. Sign up today . . . only TWO spaces left in this class! 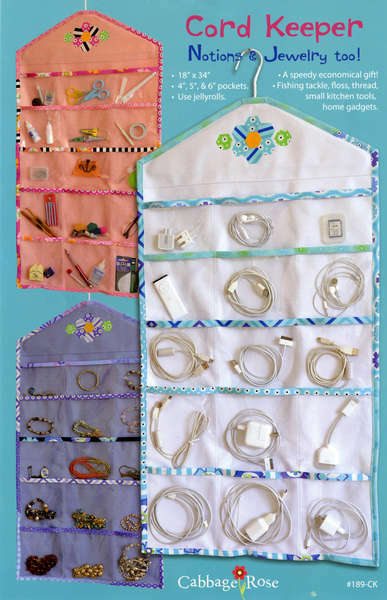 Tuesday, January 27, 2015, 5:15 p.m.
Sew this handy cord, jewelry or sewing notion organizer at BERNINA Club this month. Learn tips for sewing with vinyl, applying bindings and more. Achieve professional results with a variety of presser feet and attachments. We will start with a demo of the project and have Show & Tell from 5:15 until 6:15. Then, you have the option to stay until 8:30 to work on the the project. If you’re planning to stay for the sewing session, please bring your machine and dinner, or order in from a nearby restaurant. Beverages will be provided. Call us at 970-565-7541 to sign up for BERNINA Club. You don't have to own a BERNINA to attend. We welcome all brands of sewing machines. 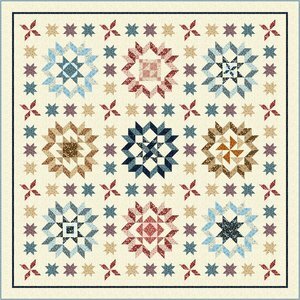 So, you've finished your beautiful quilt top, table runner, or wall hanging and now you have to decide how to quilt it. Good news . . . you have many options! Small projects such as table runners and place mats can easily be quilted on your home sewing machine, and many of our customers quilt very large (think queen size) projects on their machines. Here are seven options for quilting courtesy of Karen Childress, owner of Cortez Quilt Company. 1. Stitch in the ditch. This technique is a "must know" for anyone who pieces/quilts. Simply stitch along your seam lines to hold top, batting, and backing together. I increase my stitch length a little bit when doing stitch in the ditch and match my thread carefully to the fabric so that any little "misses" don't show. Plan your "route" so that you start and stop as few times as possible and use a securing stitch each time to do start and stop. 2. Stitch alongside the ditch. Stitch 1/8 or 1/4 inch on one or both sides of your seam lines for an echo effect. Here you can chose either matching or contrasting thread. Variegated thread is always a fun option for quilting, too. 3. Simple quilting designs. For this method use a marking tool (Frixion pens are great since they disappear instantly with a hot iron) to indicate where you plan to stitch. Engage the guide that attaches to your presser foot and you can draw only one line across/down the middle of your project and then stitch, for example, 2 inches on either side of that line, working your way out to each edge. Stitch in the other direction to create a crosshatch design. 4. Decorative stitch quilting. I did this on a set of place mats recently and the quilting came out great. I chose a decorate stitch that had a design element similar to what was in my fabric and stitched over the top of my seams. Quick and easy! 5. Free motion. You need a free motion foot (sometimes called a darning foot), the ability to lower your feed dogs, and a willingness to practice, practice, practice. Spend time doodling on paper before you practice on fabric to get the designs you are interested in stitching to translate from your fingers to your brain. 6. Hand quilting. Yes, some of us still do this. I love Gutterman hand quilting thread and use the 17" square Q-Snap frame that fits nicely in my lap. We have both at the shop. 7. Quilt-by-check. 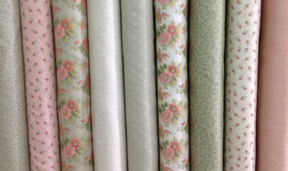 Call one of our local talented longarm quilters and let them work their magic. We are fortunate to have several amazing professional quilters right here in our area. You can drop off and pick up quilts for Amy, Beth, and Elaine here at the shop.